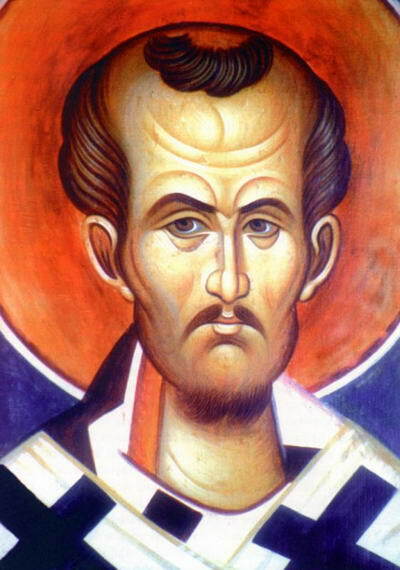 Saint John Chrysostom This great teacher and hierarch died in the city of Comana in the year 407 on his way to a place of exile. He had been condemned by the intrigues of the empress Eudoxia because of his daring denunciation of the vices ruling over Constantinople. The transfer of his venerable relics was made in the year 438, thirty years after the death of the saint during the reign of Eudoxia's son emperor Theodosius II (408-450). 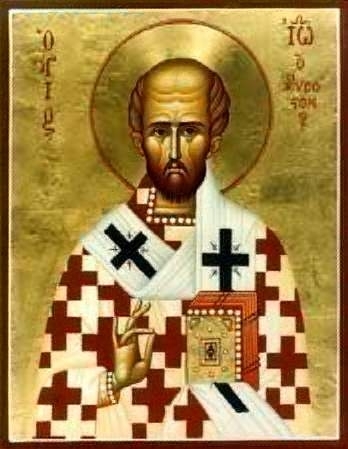 St John Chrysostom had the warm love and deep respect of the people, and grief over his untimely death lived on in the hearts of Christians. St John's disciple, St Proclus, Patriarch of Constantinople (434-447), during services in the Church of Hagia Sophia, preached a sermon praising St John. He said, "O John, your life was filled with sorrow, but your death was glorious. Your grave is blessed and reward is great, by the grace and mercy of our Lord Jesus Christ O graced one, having conquered the bounds of time and place! Love has conquered space, unforgetting memory has annihilated the limits, and place does not hinder the miracles of the saint." Those who were present in church, deeply touched by the words of St Proclus, did not allow him even to finish his sermon. With one accord they began to entreat the Patriarch to intercede with the emperor, so that the relics of St John might be brought back to Constantinople. The emperor, overwhelmed by St Proclus, gave his consent and gave the order to transfer the relics of St John. But those he sent were unable to lift the holy relics until the emperor realized that he had sent men to take the saint's relics from Comana with an edict, instead of with a prayer. He wrote a letter to St John, humbly asking him to forgive his audacity, and to return to Constantinople. After the message was read at the grave of St John, they easily took up the relics, carried them onto a ship and arrived at Constantinople. The coffin with the relics was placed in the Church of Holy Peace (Hagia Eirene). When Patriarch Proclus opened the coffin, the body of St John was found to be incorrupt. The emperor approached the coffin with tears, asking forgiveness for his mother, who had banished St John. All day and night people did not leave the coffin. In the morning the coffin was brought to the Church of the Holy Apostles. The people cried out, "Father, take up your throne." Then Patriarch Proclus and the clergy standing by the relics saw St John open his mouth and say, "Peace be to all." Many of the sick were healed at his tomb. 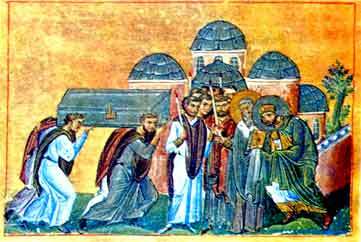 The celebration of the transfer of the relics of St John Chrysostom was established in the ninth century. It has revealed to us the heights of humility. Intercede before the Word, Christ our God, to save our souls. You teach all men to adore the one God in three persons. For you are our teacher, revealing things divine!